This message has been forwarded from Beth Houlbrooke on behalf of the Rodney Local Board. The works are intended to commence THIS week tomorrow, Wednesday - weather permitting). AT have engaged Hallett Enterprises Ltd. to conduct these works. Hallett are aware of the need to minimise disruption to wharf users, and passenger/vessel movements will not be restricted in any way. Work will pause whilst ferries and passengers are loading/unloading and on any occasions where the fuel truck is present. These works are anticipated to take up to eight working days. 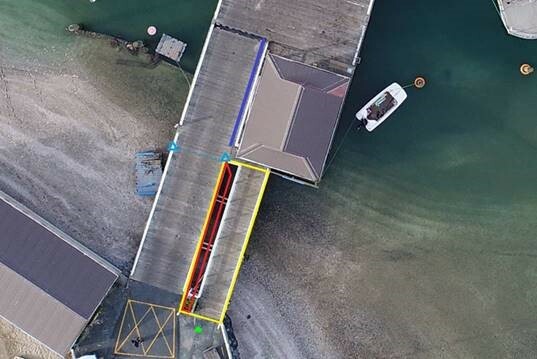 • Infill of existing gap between pedestrian walkway and vehicle section of wharf to better enable passenger and trolley flow along this section, existing deck will be replaced with continuous timbers rather than have a joint in the middle of the walkway (yellow section below). The garden at the end of the wharf will be removed, and the small plaque at the end of the wharf retained for re-installation at the end of the project. © KIRRA 2018 All rights reserved.